On Friday, Jan. 27th the Falcons hosted a double district dual match where Liberty HS. competed with Brentsville HS. first and then following that match Fauquier wrestled their final district match verses Brentsville. This event took place in the Fauquier HS. old gym as there was a basketball game also scheduled on this same day taking place in the main gym. 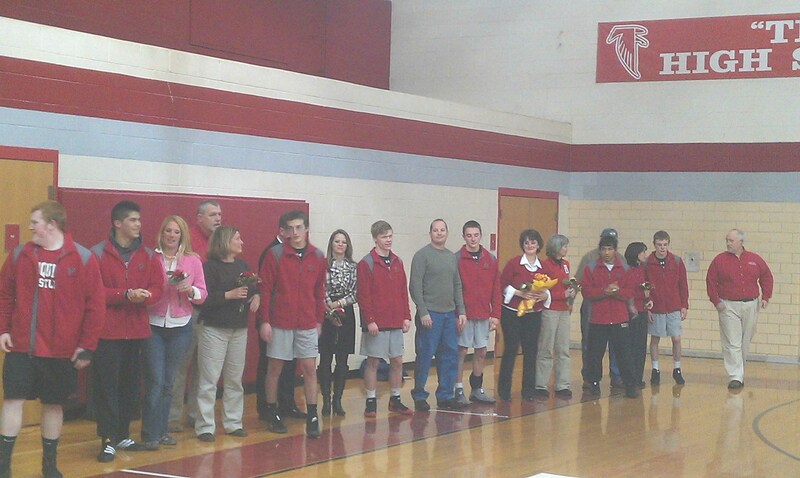 With much history in the old gym, a 7 year district dual winning streak that the Falcons were trying to obtain at stake, it was only fitting that the Falcons first would recognize all of the senior wrestlers and parents on the team as it was also senior night. Big shout out and thanks for the entire parent support to the wrestling program over the years. Fauquier Nation applauds. Once the referee blew the whistle, in the old gym, to start the first match, the Falcons did not wait long to jump out to a 24-0 lead over the Tigers. Earning three pins by Bennett Payne 126, Chuck Hilleary 132, and Tyler Budd 138, followed by Landon Dean receiving a forfeit at 145 the Falcons held on to win the match 35-27 in a classic district match. Other key victories for the Falcons were Max Strum winning 14-6 over Will Prados, Evan Oddenino at 285, and Matt Rains winning at 113 sealed this match win for the Falcons. Fauquier now extends its district undefeated season winning streak to 7 years and improved its current season record to 15-2. Below is the match results of Fauquier vs. Brentsville - Home meet. Individual Results vs. Brentsville HS. Note: Fauquier now extends its district undefeated season winning streak to 7 years. The next day on Saturday, Jan. 28th Fauquier then traveled to Forest Park HS. for a Quad meet with AAA Hanover, AA Poquoson, and AAA Forest Park. Fauquier would need to bring it’s A game to this quad as district foe was nowhere near as talented as Handover HS. who is one of the strong wrestling teams out of the Richmond area, with several state ranked wrestlers on the team. And let’s not forget Forest Park HS. ; many folks would agree that FPHS could be the best team on the mat. Forest Park currently rests right behind Fauquier by the Washington Post Metro ranking with three number 1 ranked wrestlers in the AAA state ranking. And did I state that Fauquier was wrestling at Forest Park? One could have made a case that this quad meet might have been the best event to go see with great teams going head-to-head. Fauquier ended up going 2-1 at the Forest Park Quad. They started the day by falling to Hanover 37-36 in a close battle that came right down to the last match. Fauquier already had experienced situations like this where their current two losses at the Virginia Duals came right down to the final matches. Once again the Falcons found themselves right back in the mix needing to pull out a victory in the final match. The Falcons were up 36-34 going into the last match verses Hanover, but once again they could not pull off the final match. Although both teams were all square and had won 7 matches each, Fauquier had one less bonus point match win than Hanover did which made the difference. Tyler Budd records the only pin for Fauquier. The Falcons then faced off with AA Poquoson out of the tidewater area as they picked it up with a big win 55-16. Ten of the Falcons got their hand raised with pins coming from Max Strum at 170, Marco Tcheukado at 106, Matt Raines at 113, Chuck Hilleary at 132, and Tyler Budd at 138. The final match then concluded with Fauquier up against Prince William County power Forest Park HS. as this was a nail biter victory for Fauquier winning 40-39. Forest Park had the lead 39-34 going into the last match with Fauquier 5 points behind. The Falcons had to find the will to pull out a pin in the last match to top Forest Park and that’s just what they did. Fauquier was down 27 to 10 after the seven matches as they had Bennett Payne at 126, Tyler Budd at 138, Landon Dean at 145, Jake Raines at 152, and Max Strum at 170 all earns pins to seal and finish with a thriller victory to close the regular season. To conclude the weekend and to review this quad, both Hanover, Forest Park, and Fauquier all went 2-1 for the day. These three teams were so evenly matched that no team earns the right to be called the quads best. With the regular season now over, the Fauquier closes with an overall record of 17-3. Fauquier looks to host the Evergreen district tournament next weekend on Saturday, Feb. 4th as the Falcons try for their 7th straight district title. The schedule times: TBA. Below is the match results of Fauquier @ Forest Park HS - Quad meet. Individual Results vs. Hanover HS. Individual Results vs. Poquoson HS. Note: Match started at 2pm. Falcons won 10 matches. Individual Results vs. Forest Park HS. Note: Match started at 3:10pm. Forest Park had the lead 39-34 going into the last match as Fauquier won by pin and won 40-39 in a close finish.